Don't get too worry about the project we will go step by step through it. Click the add comment link to make your posting. Make sure you have three seperate ones. It was originally released on June 23, 2008. They are currently on their 5th release which was released on January 28, 2009. Chartgizmo is powered by WordPress. "WordPress is a state-of-the-art publishing platform with a focus on aesthetics, web standards, and usability. WordPress is both free and priceless at the same time." Chartgizmo has their own page of testimonials. [http://chartgizmo.com/Testimonials] Seems like they make chart making easy and fun. Looks like we will have some fun with this project. If you are a webmaster and a data geek you will love chart gizmo. This totally free application will allow you to insert charts into your site. Chartgizmo has a specific manual able for download that makes chart creation much easier! It breaks down all of the various charts you can make, and how to create them. One of the many features of Chartgizmo is data import from Excel is available. You can create charts and place them on your website, blog and social network profiles. They are very universal and can be utilize in a variety of ways. Data import from Microsoft Excel is available, making it easy to put already completed data into your chart. Chartgizmo can help businesses create charts or graphs showing how they grow as a company and what projects they are working on in an organized fashion. In the future, Chartgizmo is expected to have data collection, more diagram types, and more options to work with throughout the site. ChartGizmo can be useful for those who need to visualize financial, scientific or other type of data. There is a page that allows you to see examples of ChartGizmo in use and give you an idea of what kind of charts to expect from this application. A history feature is available, allowing one to simply collect and show your historical data. If someone wants to use ChartGizmo, he or she has the choice to pick the design of the chart or graph and the source data desired. Customizing these is also an option. History feature is available on ChartGizmo. Collecting and showing data on this site can be accomplished in an organized manner. ChartGizmo is completely free, but is costly to run. There are server costs,application maintenance costs, administration costs and legal costs, among others. 1. Tell everyone about this great free chart maker on forums you hang out at, in news letters, word of mouth. Just shout about ChartGizmo as loud as you can from the rooftops if you like. 2. Link back to ChartGizmo from your website. Why not blog about us and link back to us from your blog. Add us to your social bookmark site of choice. Hell, why not video yourself making your chart design and put it up on youtube. 4. Make a direct donation of money via paypals donate system. No matter how small or large, all money is appreciated in helping with the operating costs." Maxim Kuchin MAY BE the creator, Still looking into details. has an app for your phone where you can chart things on your phone and then send it to other places or co workers. "Reading information is one thing, but seeing it presented in a graphical way makes it so much more appealing and understandable." it also has a manual and a self help page to make this simple program even simpler and easy to use. interacts with alot of other programs such as facebook, myspace, windowslive, digg, google, plus more. either it is provided specifically for information visualization." Here you can find the same information about ChartGizmo in different languages, like Chinese, Korean, Japanese, French, Russian etc. ChartGizmo is a Web-based, simple and powerful online tool to create interactive charts and graphs from static or dynamic data which may be generated using any scripting language. Support full updates and data streaming without reloading the web page. Support 3D customization, including perspective, lighting, rotation, border skins, anti-aliasing, transparencies, isometric projections, shadows, and more. Support automatic and manual layout and alignment management. Support fully customizable legends. Support export chart in a variety of formats including BMP, JPG, PNG and EMF. You can also create charts by importing data from external sources such as Excel spreadsheets. The diagram types that ChartGizmo supports are Pie, Bar, Line, Ring, 3D Pie, 3D Bar, 3D Line, Candle, Scatterplot and TimeSeries. Once you have created a chart, you can customize it by adding title, background color and chart legends. 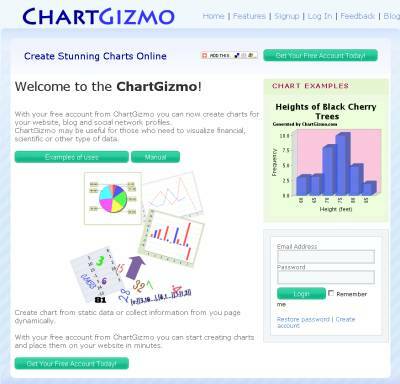 ChartGizmo is a web service that allows you to make charts easily without a spreadsheet program. ChartGizmo is commonly used in Japan. In website http://web-tan.forum.impressrd.jp/e/2008/09/04/3720 one can find different chart builders sites with full explanation of the content, information whether site is free, interface language, etc.